Slots Million Free Spins Bonuses & An Awesome Raffle Till Aug 2, 2015 - Act Now! Summer is heating up and in traditional fashion, when the sun comes out the real good casinos on top of their game turn up the heat. Expect lots of special goodies for all the loyal and new customers alike. There are always lots of Free Spins Bonuses too! One of the newer casinos around, established only last year in 2014, and formed from a vast array of industry know-how and talent, is Slots Million. If it's Free Spins Bonuses the player is looking for, welcome to the right place! Based in Curacao, as well as setting up a regulatory license from where they operate, they also acquired a gaming license from one of the strictest regulators that being the country of Malta. With a double seal of approval from two governments, the new player can be assured he is not dealing with some new upstart rinky dink operator, but a casino that is serious about offering players the very best in games. All new players receive a 100 Free Spins Bonus and a 100 Euro matching bonus just for stopping by and saying hello! On top of that, they have now announced some great summer specials, just to turn the excitement level up another notch or two in the process! With one of the largest HTML5 library of games on the planet with a current total of 871 games to get one's head around, expect to see a congregation of all the world's greatest developers such as NetEnt, iSoftbet, NextGen, Microgaming, Games OS, and of course Rival Gaming. Win a new Macbook Air Playing Hot As Hades Slots! Slots Million just offered 20% up to 200 euros cash back on losses on Rival Games Slots. 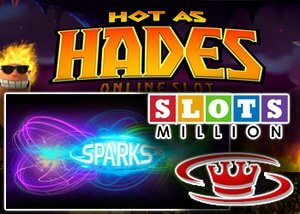 Players of the fantastic new Microgaming slot Hot As Hades should now prepare for a chance to participate in an extraordinary raffle that runs till August 2nd. With each 50 Euro wagered receive an entry ticket where some great prizes are on offer. Here's just a few that lucky players are going to win: A Console bundle valued at $700, an iPhone 6, a MacBook Air, A Bose Mini Bluetooth Speaker, and an iPad 3 mini, that's just for coming 2nd in the Raffle! There are prizes for 5 lucky players and in addition to the prizes mentioned above the winning ticket also receives a 55" inch TV!! Pop on over and get some free spins from Slots Million Casino without delay. Grab the chance to walk away with a memorable prize just for playing a grand new game. Life just doesn't get any better, does it, don't delay do it today, whilst there's still a chance!